Bineta Diouf (left) has been playing basketball at Basket Landes since 2003. So it should come as no surprise that most of the players from last season are still at the club. 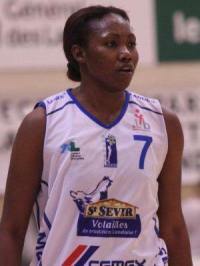 Diouf played for Senegal at the FIBA World Championship for Women while club captain Marion Laborde played for France. Amélie Pochet, who joined the club last season but ended up not playing after tearing an ACL, will play for Basket Landes this season. Jennifer Humphrey returns to the club after one season at Calais. So the only new signing for the club is Katarina Manic. Two of the departing players will continue to play basketball in France. Ekaterina Dimitrova who played for Basket Landes for the last two seasons has signed for Charleville-Mézières while Sabrina Réghaïssia has moved to Aix-en-Provence. Anne Perovic left the club during the season because of an injury and was replaced by Aja Parham. The LFB roster for the coming season is as follows: Katarina Manic, Aminata Konate, Bineta Diouf, Anaïs Le Gluher, Julie Barennes, Laurie Lapeyre, Julia Borde, Marion Laborde, Amélie Pochet, Jennifer Humphrey.